There’s something outside the White House with a quiff that holds a lot of air—and not much else. It is, of course, a giant chicken. The inflatable bird appeared in a public park yesterday right by the White House and was put up—or rather blown up—by Taran Singh Brar. Speaking to The New York Times, Brar said it had taken four months to get permission from the National Park Service but had just “kept calling, kept showing up in person and kept emailing,” to get his way. The chicken had cost Brar $1,300 online and was inspired by a similar looking chicken found in a Chinese mall in 2016 when it was the Year of the Rooster. This particular chicken was designed by Casey Latiolais, an artist from Seattle. Latiolais’ drawings were, according to Brar, sent to China where they were used to create a cold-air water balloon. Brar had the deflated bird sent to Washington, D.C. where, with the aid of some volunteers, ropes, and sandbags, was able to erect the chicken. The chicken even has an official name. 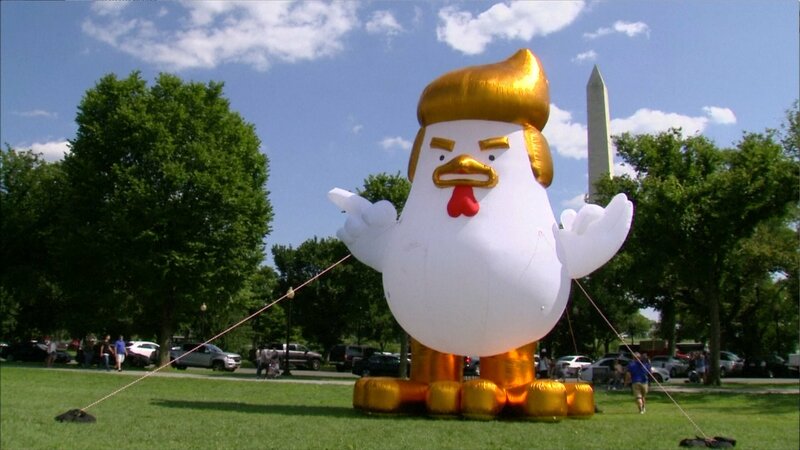 “Donny, official fowl of the Tax March” can be found on Twitter under the handle @TaxMarchChicken. “This isn’t my first rodeo. I’ve been all over the country crashing Trump events,” Tweeted Donny yesterday, citing four other instances. As for Brar’s outing of the big bird, the President will not see his doppelgänger. Trump is playing golf (unsurprisingly) in Bedminster, New Jersey, as work is done to the Oval Office.